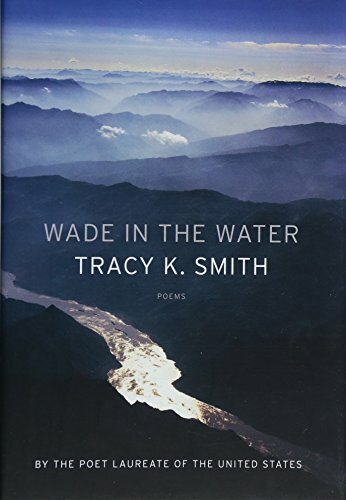 Tracy K. Smith’s Wade in the Water is a bold move. Before cracking the spine, the reader is reminded of the folksong “Wade in the Water,” which stems from slavery during the American Civil War. The song is well documented throughout American spoken and literary history. It is studied and sung in several cultural and academic institutions. Thus the collection’s title challenges the poet to engage “Wade in the Water” with historical accuracy, in addition to providing the creativity which poetry demands. Smith cannot be cliché. She must offer something new. Let’s see if she does. This short collection is divided into four chapters, each of which carries a sole number instead of a title. The chapters are treated like movements instead of titled subject groupings. Without titles, the casual reader must decipher what each chapter is about, which risks confusion, especially for younger readers. Nevertheless, all readers will enjoy the diverse array of poems that range from personal reflections on family to statements on American industry, history, and slavery. Some are formal; some are rhymed; all are enjoyable. At times the poems lean philosophical and pose questions to the reader. This is risky in poetry because it frequently leads to misinterpretation. A casual, especially young, reader might imagine something completely different from the poem’s subject matter, thus risking confusion. The reader might answer the posed questions incorrectly and misunderstand. “Driving to Ottawa” is a landscape of images and relationships that heighten the senses, and then gradually fade away, to create a strong sense of melancholy as life passes by into shadows. Here are the last three lines: “How much more will we bury / In the earth? How much / In this dark where the earth floats?” How much? The reader does not know, thus the poem feels incomplete and open-ended. It leaves readers grasping for more. Smith knows this. She accepts the risk. Chapter II is the most poignant. It is a series of letters written by Civil War troops and their families, all of which include images of brutality, slavery, and death. It is unclear as to whether they are all Confederate, or if some are Union; it does not matter, neither does race. What matters are the overwhelming emotions. There are also random instances of capitalization and gaps, to further create differences of knowledge and education. All techniques accumulate into poems of desperation—soldiers and families begging for money, freedom, and home. It is clear that Smith researched genuine Civil War letters, and then decided to write her own, rather than write poems inspired by the era. It is very effective. “Watershed” is arguably the most experimental and stirring poem. The images literally “shed” across the pages. To reveal the catastrophic impact of toxic waste and carcinogens, of everything humans do to destroy the earth, Smith pours forth gruesome images of death and decay. Here’s more: “PFOA: increased the size of the liver in rats and rabbits / results replicated in dogs / caused birth defects in rats”. And more: “PFOA detected in: / American blood banks / blood or vital organs of: Atlantic salmon / swordfish / striped mullet / gray seals . . .” The list goes on and on. Then later: “I could perceive the Earth, outer space, and humanity from a spacious and indescribable “God’s eye view.”” And then: “I could feel Earth’s desperate situation. Her aura appeared to be very strange, made me wonder if it was radioactivity. It was bleak, faded in color, and its sound was heart wrenching.” The poem proves its point: clean up the water and save lives. It must be said that after multiple reads, “Watershed” becomes an anomaly in this collection, regardless of the poem’s title. Although fascinating, this poem, along with a few others, doesn’t seem to belong, especially when juxtaposed to the letters in Chapter II. Thus the collection leans incohesive. It might benefit from further explorations of loss and sacrifice, and what it means to die for something we believe in. But those are merely suggestions for an already admirable body of work. Smith does not sugarcoat her poetry. She is direct and uses clear images and line breaks to create powerful metaphors. Readers will be moved by this carefully crafted collection. It is entirely new and innovative. Wade in the Water is a treasure, a chest of historical gems, which offers spectacles for everyone to adore. Andrew Jarvis is an award-winning poet whose most recent book is Landslide. His poems have appeared in Cottonwood, Evansville Review, Valparaiso Poetry Review, and other magazines.